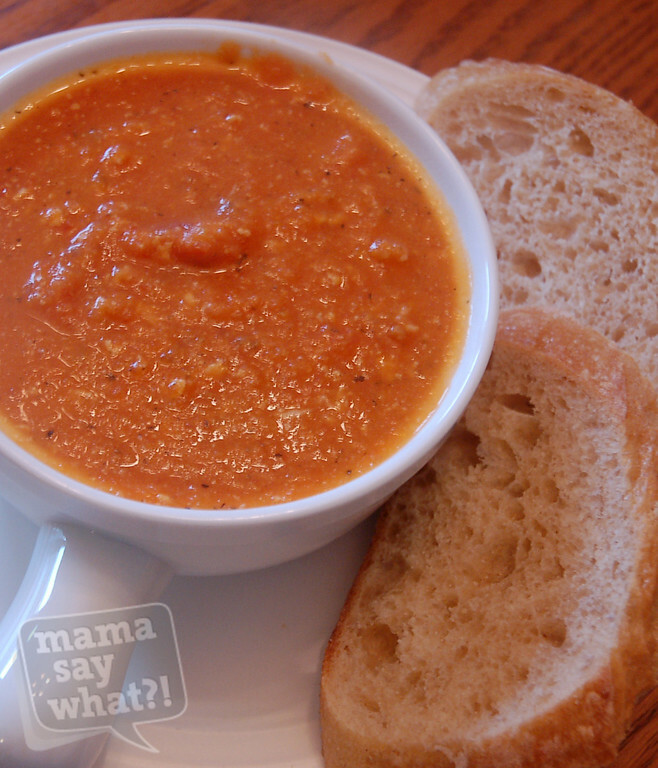 Rainy Day Cheesy Tomato Soup Mama Say What?! | Mama Say What?! 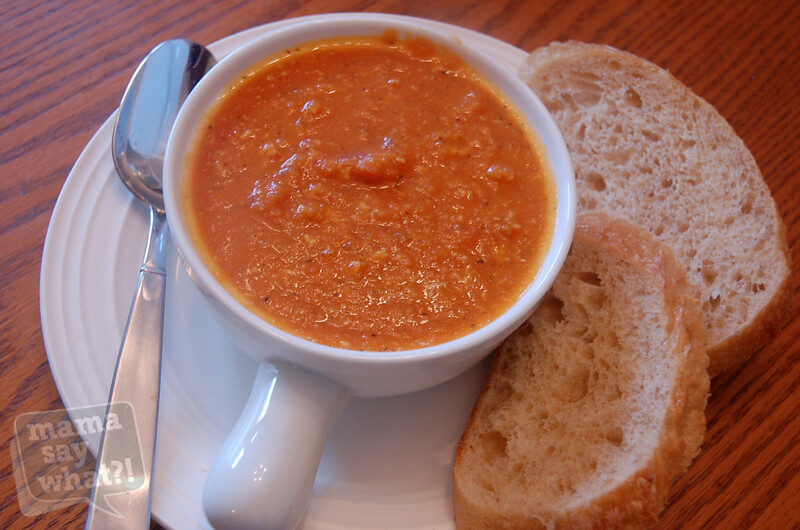 The inspiration for this soup came from a little café called The Shaker Shed. After going there with my mama for lunch and trying their Tomato and Macaroni soup, I was blown away and wanted to re-create it for dinner the next night. I think I did a pretty good job! And yes, it was a rainy day on the day I made it, hence my original name. I threw this together without following a recipe. I just figured I had enough in my pantry and fridge to give this a go and just thought of the things that I tasted in the soup from The Shaker Shed. The beauty of this soup is that it’s very forgiving – you don’t have to follow my recipe exactly and it will still come out fantastic. Add or remove whatever you think you’ll like and make it your own. 1. Pre-heat the oven to 425° Farenheit. 2. Drain the diced tomatoes and reserve the juice. Spread the tomatoes in a 9″ x 13″ jelly roll pan. 3. Add all of the vegetables (tomatoes, onions, garlic, carrots, celery) and spices (salt, pepper, bay leaves, thyme, basil) to the diced tomatoes on the jelly roll pan. Mix with a spoon and top with extra virgin olive oil. 4. Roast at 425° for 30 minutes, stirring after 15 minutes. 5. Empty the roasted vegetables and spices into a soup pot. Add the reserved tomato juice and vegetable stock. 6. 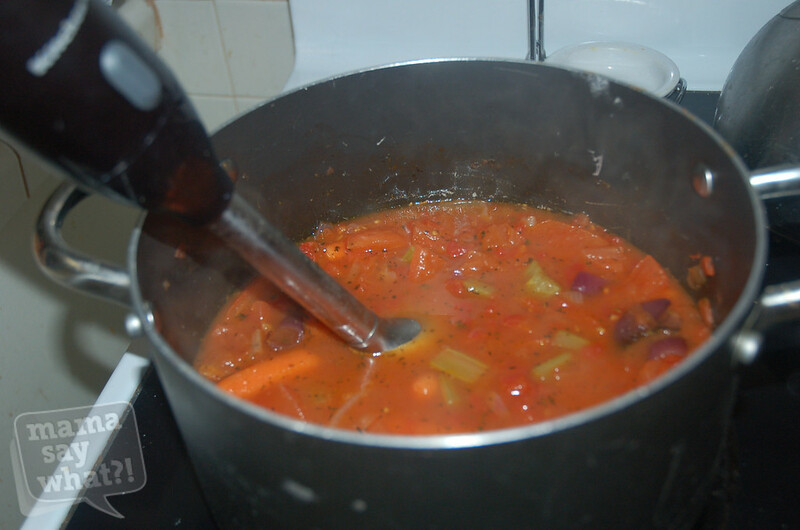 Simmer for 20-30 minutes to soften the vegetables. 7. Remove the bay leaves and blend using an immersion blender (or you can blend in batches with a blender or food processor). 8. Add the half and half, cheeses and stir. I was trying to keep this soup fairly healthy, but I think heavy cream, some more high-fat cheese and some macaroni would make it even more delicious. Pre-heat the oven to 425 degrees Farenheit. Drain the diced tomatoes and reserve the juice. Spread the tomatoes in a 9×13 jelly roll pan. 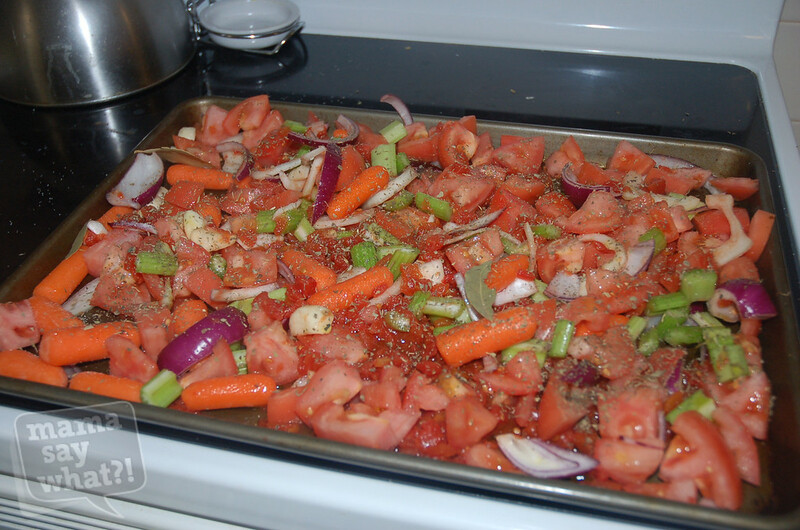 Add all of the vegetables (tomatoes, onions, garlic, carrots, celery) and spices (salt, pepper, bay leaves, thyme, basil) to the diced tomatoes on the jelly roll pan. Mix with a spoon and top with extra virgin olive oil. Roast at 425 for 30 minutes, stirring after 15 minutes. Empty the roasted vegetables and spices into a soup pot. Add the reserved tomato juice and vegetable stock. 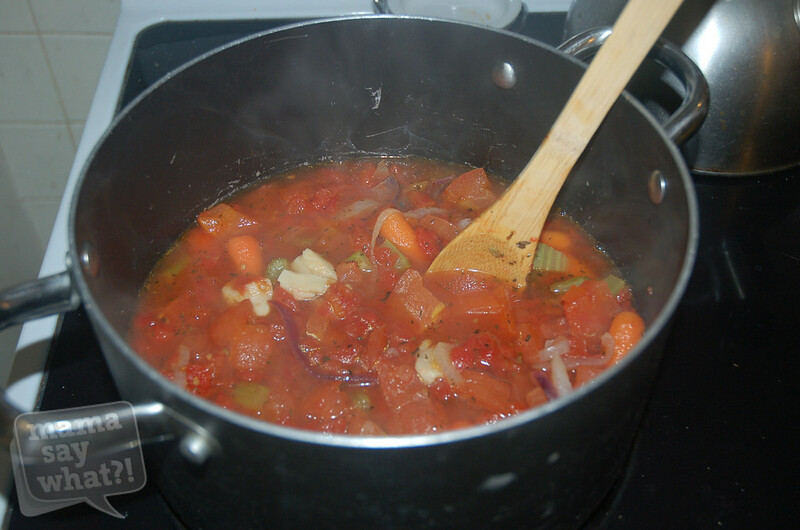 Simmer for 20-30 minutes to soften the vegetables. Remove the bay leaves and blend using the immersion blender (or you can blend in batches with a blender or food processor). Add the half and half, cheeses and stir. Added by MaryEllen M. on April 12, 2013. This is totally on my to-make list! Especially with this horrible cold weather we are still having! This sounds so yummy! Can’t wait for it to get cold & rainy around here again to try it! This looks SO delicious. Definitely on my to-try list this week. I’ll have to make it with some grilled cheese sandwiches! Thanks for sharing!